In this review I’ll tell you more about the Billingham Hadley Pro shoulderbag. Billingham is a British company that produces high quality, high end camerabags. Billingham started making bags in the seventies, these were geared to fishermen. Soon it was clear there was another potential target population: Photographers. They loved the sturdy canvas bags even better than the fisherman because the bags where comfortable to use and protected their expensive gear from the elements. Billingham soon decided to change their focus (no pun intended) to making camerabags. Today Billingham is kind of the Rolls Royce of the camerabags. Luxurious details, high quality finish, handmade and with an clear British style. 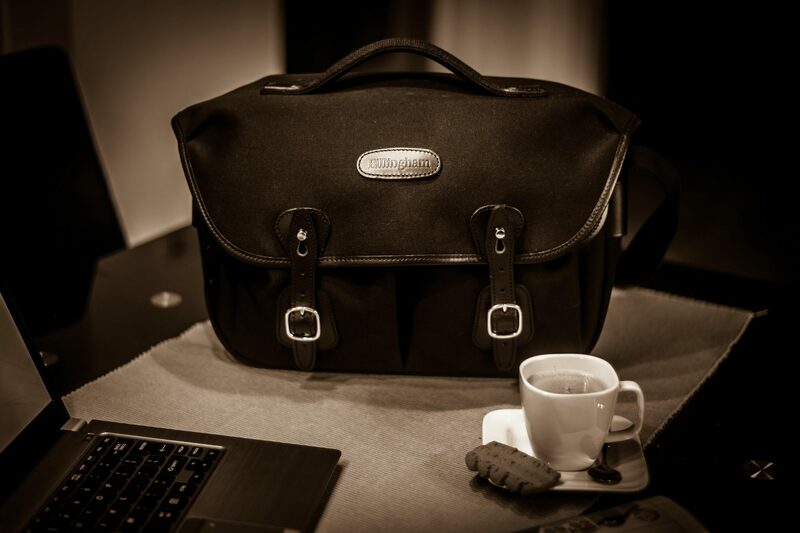 The Billingham bags still have the recognizable style from the beginning of the company. But over the years Billingham did add a lot of different new models, sizes and colour-options. This review is about the Billingham Hadley Pro. Size-wise the Hadley Pro is a middle size version of the Hadley range. The Pro is a little different than the ‘normal’ Hadley’s as it has some smart extra details like the big top handle. With the handle picking the bag up is even easier. If you are familiar with the Billingham bags you may know the classic colour-combinations like the sand-brown fabric with brown leather or the green with brown combination. Nowadays the Billinghams are available in a lot of different colours. You can get one in grey (with grey or brown leather) but you can also get them in fluorescent orange, baby-blue or even in camouflage. The bag in this review has got a more subtle colour, with black fabric combined with black leather. 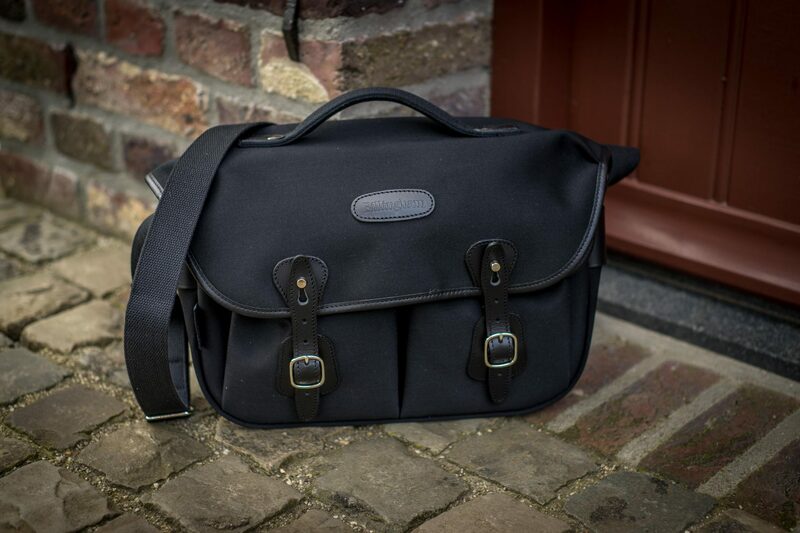 The Billingham Hadley Pro has got a classic messenger-style design. The bag features a big flap that protects the contents from rain and other external influences. On top of the big flap you’ll find the top handle made of canvas with leather reinforcements, only the Pro-version has got this handle. Billingham didn’t just attach this handle to the flap, but they’ve added extra reinforcements in the flap. By putting a flexible strip (plastic?) in between the layers of fabric the load on the handle is distributed over the whole top. That means you should be able to fully fill the bag and lug it around by the handle for years without the handle damaging the flap. On the front of the flap you’ll find a small oval piece of leather with the Billingham logo embossed on it. The outer edge of the flap is also protected with leather. The top flap is very wide so it protects everything you put in the bag from rain or dust even in windy conditions. The fabric Billingham has used for this bag does show that Billingham, despite the classic designs of their bags, isn’t stuck in the past. This bag is made from ‘fibrenyte’, that is Billinghams name for the fabric they use as an alternative for canvas. Fibrenyte has got some advantages over canvas, it’s lighter, the colour doesn’t fade and its more water resistant. During the review period the water resistance was tested more than once, even in the pouring rain the bag kept the contents completely dry while the water ran off the bag. Some Billingham bags are still available in canvas, but I’d always choose the modern fibrenyte, as it looks a lot like canvas but with the advantages of synthetic fabrics. At the front the flap is held closed with leather straps with a quick release system. The quick release system works very well, just pull the straps upwards and pull them off the brass studs. At first the leather is a little stiff, but it get more supple over time. The leather straps also have solid brass buckles that allow you to adjust the lenght. That way you can loosen them if you have a lot of stuff in the bag so you can still safely close it. The leather straps feel very durable, but if you do manage to wear them out over time you can just order new ones from Billingham. 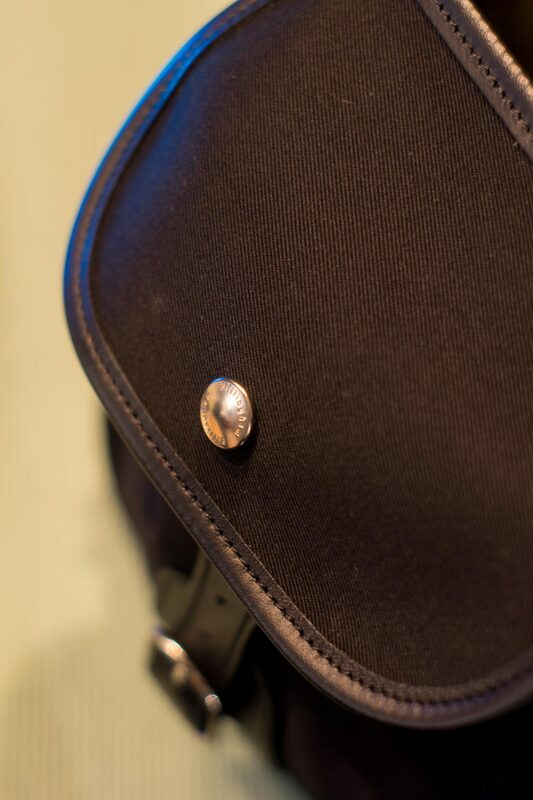 All metal parts on the Hadley Pro are solid brass, so those parts are also very durable. On the back of the bag there is a big zippered compartment over the whole width of the bag. It is big enough to store a magazine, but will also fit an iPad. The shoulder strap is attached to the side of the bag. The strap itself is wide and made of a supple material and it has got a buckle to adjust the length. 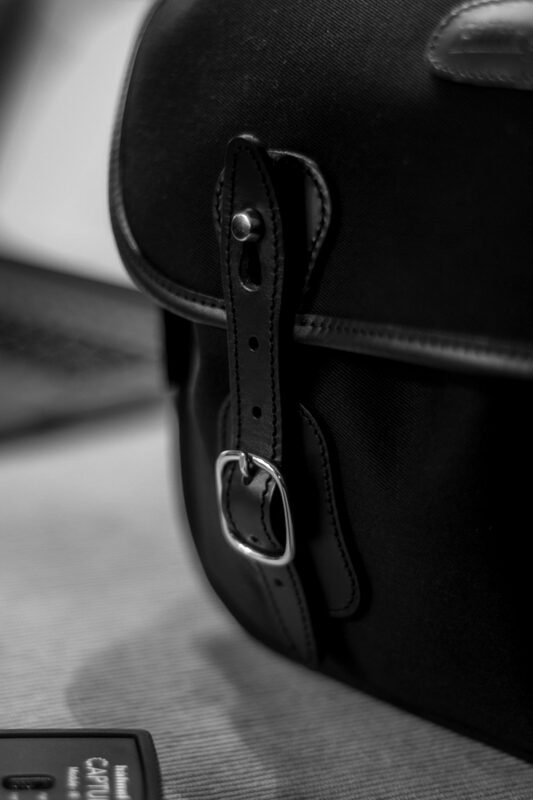 At the point where the shoulder strap is attached to bag Billingham has used big pieces of leather to reinforce it and to distribute the weight of the bag evenly. The strap itself doesn’t have a shoulder pad. In normal use that isn’t really a problem as the strap is wide enough. If you do lug around heavy gear or other heavy stuff you could always buy an optional leather pad from Billingham. For the price of the bag it would have been nice if they did supply it with the bag. The leather reinforcements for the shoulder strap do have a second use. They can be used to attach optional AVEA-pockets. That are small extra pockets you attach to the side of the bag to take extra stuff with you. They are available in different sizes and models. So if you need extra room you can always expend your Billingham Hadley Pro. When you open the big flap you’ll find a roomy interior with a big camera compartment and two smaller front pockets. The front pockets each have their own flap that is held closed with a big press stud. The pockets are deep and roomy. If they aren’t big enough for the stuff you want to take you can make them a little bigger. There is an extra stud in the corner of the pocket you can open to increase the size of the pocket by about 1/5th. The camera insert is attached to the main compartment with one stud. If you want to use your Billingham Hadley Pro as a ‘normal’ messenger bag you can easily pull the insert out of the bag. This works a lot better than with bags that use Velcro to attach the insert to the bag. The camera compartment is roomy and has got thick padding. It’s made of a very soft material that feels great but also protects your camera against scratches. 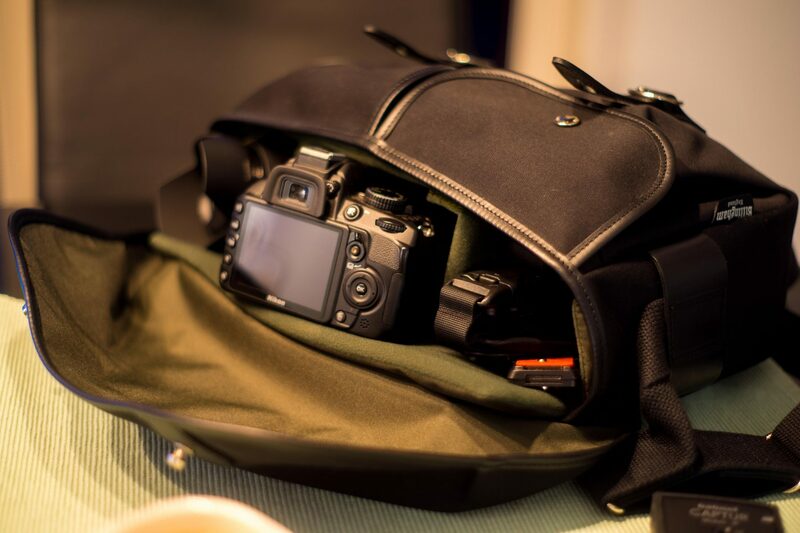 The outside of the camera insert is made of a synthetic fabric that makes sliding the insert in to the bag easy. 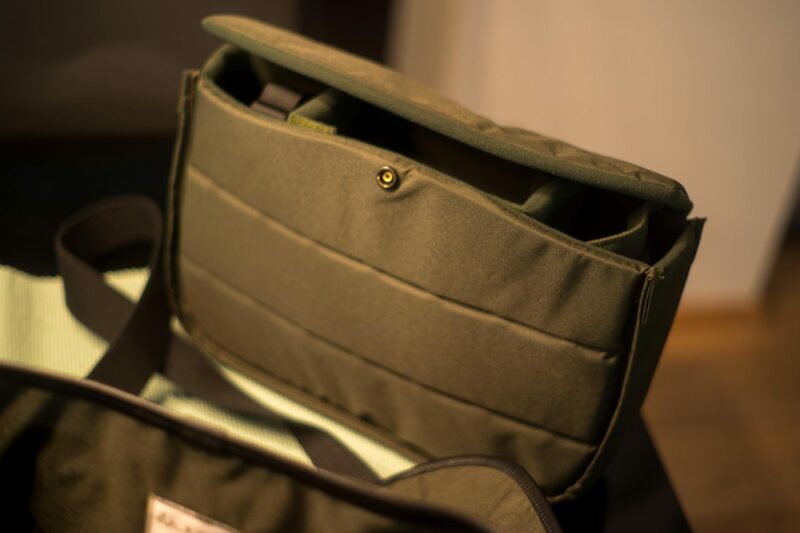 The insert also has a top flap to protect your camera from thing falling on top of the bag or when the bag tips over. Because the outside of the insert is made of a synthetic material the top flap will also keep your gear dry if you open the top flap to take something out of the front pockets. The camera compartment is big enough to store a DSLR with a midrange zoom lens and two or three lenses or two lenses and a speedlight. You’ll get two large dividers and one small one. The small one can be used to stack two smaller lenses on top of each other. My Sony A7 with kit lens fits perfectly in the Billingham Hadley Pro, but even with the bulky LA-EA4 adapter with an old Minolta lens attached the Billingham Hadley Pro doesn’t break a sweat. Because of the thick padding even my smaller camera is held in place perfectly. Taking a new Billingham out of the box feels a little like Christmas. Besides the great small of real leather you also get a nice protective bag you can use to store your Billingham in when you’re not using it. Another clue you have bought something special is found in the main compartment. 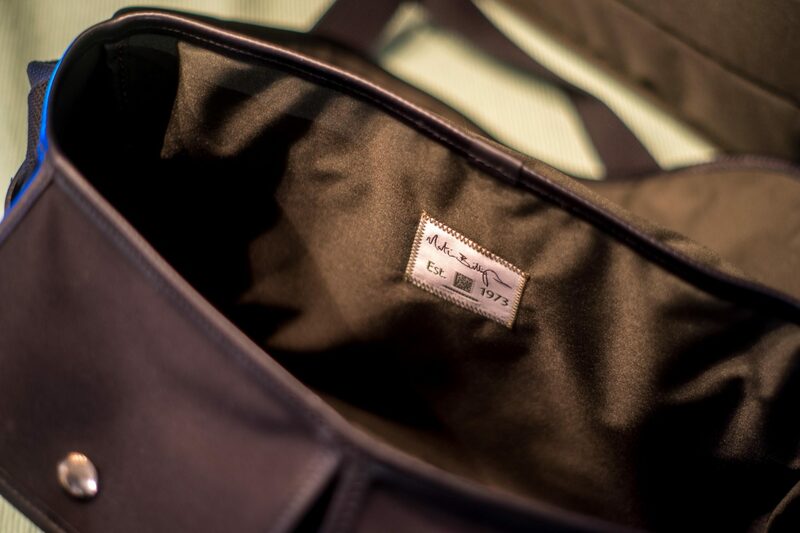 On the back of the compartment you’ll find a label with the personal signature of Mr. Billingham himself. The label also has got the unique serial number on it. Which other bag has got an unique serial number?! In daily use the Billingham Hadley Pro is a great companion. The size is just right and because of the supple fibrenyte fabric the bag forms to your body perfectly. The size of the Billingham Hadley Pro is small enough to take everywhere, but big enough for my most used gear. The bag itself only weighs one kilogramme (2 pounds). That light weight is probably because of the light fabric, because the leather and brass Billingham has used is thick and heavy. In the rain fibrenyte worked like a charm. Water couldn’t get a grip on the fabric and it kept my gear completely dry. That gave me the confidence to use the bag even in heavy rain and without an extra rain cover. With its subtle black on black colours you won’t attract any unwanted attention. I did receive compliments about the nice bag had with me, but no one saw it was a camera bag. That is an advantage if you ask me, I don’t like bags that look to much like an expensive camera bag. That will only attract attention from the wrong people. If you do want to stand out in the crowd you could always choose to buy your Billingham in one of the more extreme colours. One of the things I like about the Billingham Hadley Pro is that it is semi modular, and that parts that may wear out over time are easily replaced. If you bought your Billingham and you come the conclusion that you need a little more room you can just buy one or two AVEA-pockets. The same goes for the dividers, if you need more they are available as optional accessories. Replacement leather straps are available also. A Billingham is far from a cheap bag, but because of this you can use it for years and it can even grow with an expending set of gear. So if you choose to buy a Billingham Hadley Pro you’d better be ready for a long term relationship. I don’t think an amateur photographer can wear this bag out with normal use, and it will even stand up to years of professional use. It’s my favourite shoulder bag by far. Therefor I’ve lovingly named mine Billie, and it is here to stay!